Peacefulness, serenity, close contact with nature and breathtaking views. These are the essential ingredients to relax from your stressful workdays and this is what you will experience here on our unique property in a modern and high quality Eco-retreat. 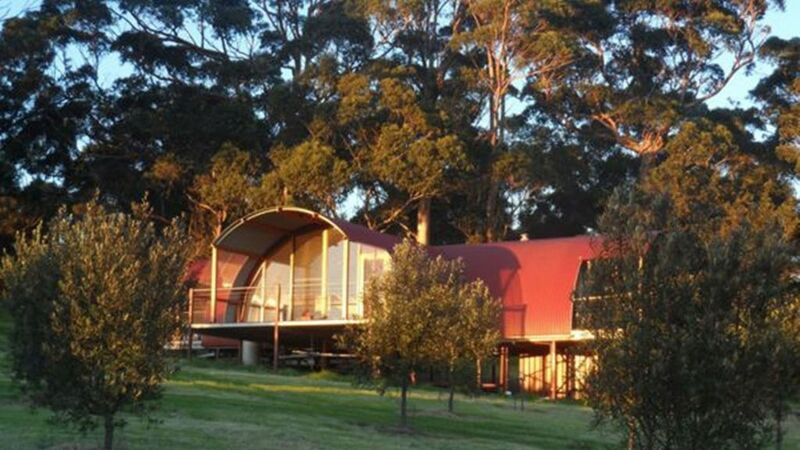 Built on the top of Tennessee Hill, on a property of 50 acres classified ¨Land for Wildlife¨, these self-catering eco-chalets of an original and unique shape overlook the plain from the Wilson Inlet to the Porongurup and Stirling Ranges (breathtaking >180° view). Our self-rated number of stars is 4½. Their wood design provides a cosy and sound atmosphere. We have given an utmost attention to all finishes, to the equipment and to an easy access for the disabled. The chalets are double insulated, orientated to take maximum advantage of the sun and a heat pump supplies the hot water. Farmstay - cattle, goats, emus and many other animals will welcome you on our property. We planted thousands of trees on our property, a paradise for hundreds of wonderful birds. I'd hoped this place would be special and it didn't disappoint. The chalet was a delight and it made great use of the wonderful scenic view. Sunrise and sunset were a real treat. The chalet is absolutely stunning, adored the huge windows and all the light, loved the balconies and being able to eat out on the deck, looking out over the landscape. Just the best place to stop and take a moment and relax. Goats were great, very friendly, and pup was very eager to show them off, which was adorable. Claudia is an amazing host, very accommodating, very lovely and very easy to get in touch with. Thank you so much for an amazing stay, will be back! We had fantastic time at Tennessee Hill Chalets. Excellent accommodation, beautiful views, very friendly host. Highly recommended.